Died on January 18, 2004 from injuries sustained two days earlier when an IED struck his vehicle near Samarra, Iraq. Kelly graduated from Paschal High School in Fort Worth in 1985 and attended Tarleton State University for one year, playing on the college’s football team, before enlisting in the Army in 1987. At first he trained as an infantryman but was eventually promoted to drill sergeant. He volunteered for duty with the Special Forces in 1990 and served as a combat diver, a free-fall parachutist and a jumpmaster. Kelly did one tour of duty in Afghanistan and was serving his second tour in Iraq when he was killed. With almost 17 years of service, Kelly was awarded several awards and decorations during his service, and was posthumously awarded the Silver Star, Legion of Merit and Purple Heart. 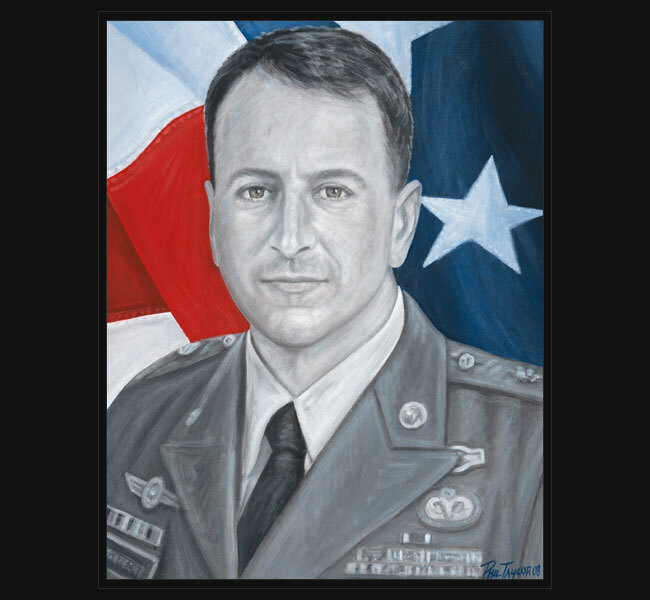 Original portrait was presented May 4, 2009 to Kelly’s parents, Jeff and Camille Hornbeck, during a special reception held at the corporate offices of The American Fallen Soldiers Project.